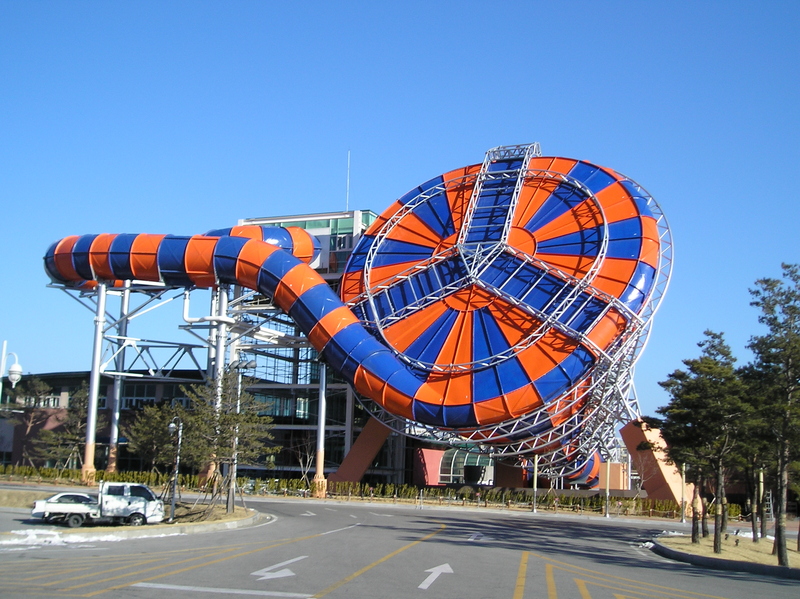 In 2010, WhiteWater West Industries Ltd. introduced the Abyss, a raft slide that culminates with the largest cone/funnel in the world. 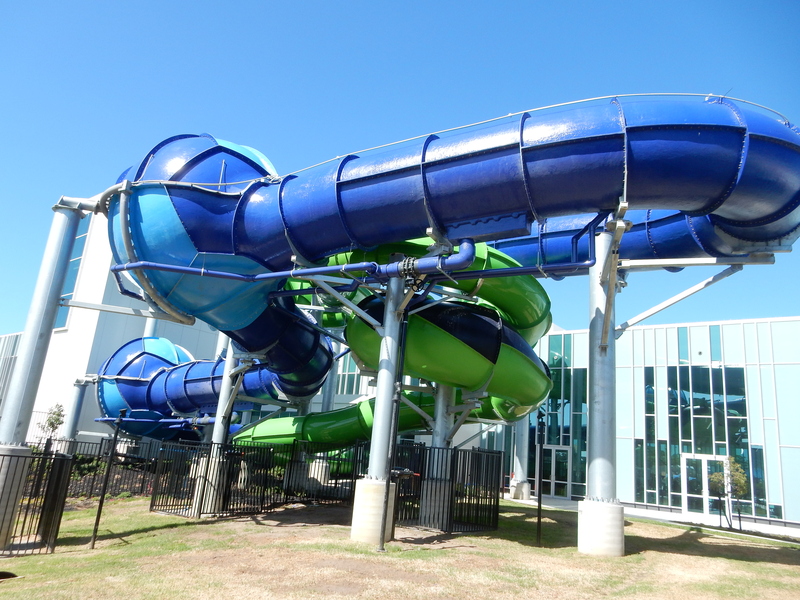 Using large round 6 passengers rafts, the focus in most installations is to have a long run to the funnel and thus give a longer experience than many other water park attractions. The funnel itself is a triangular shape with an open bottom and stand 71 feet tall for the most popular model. 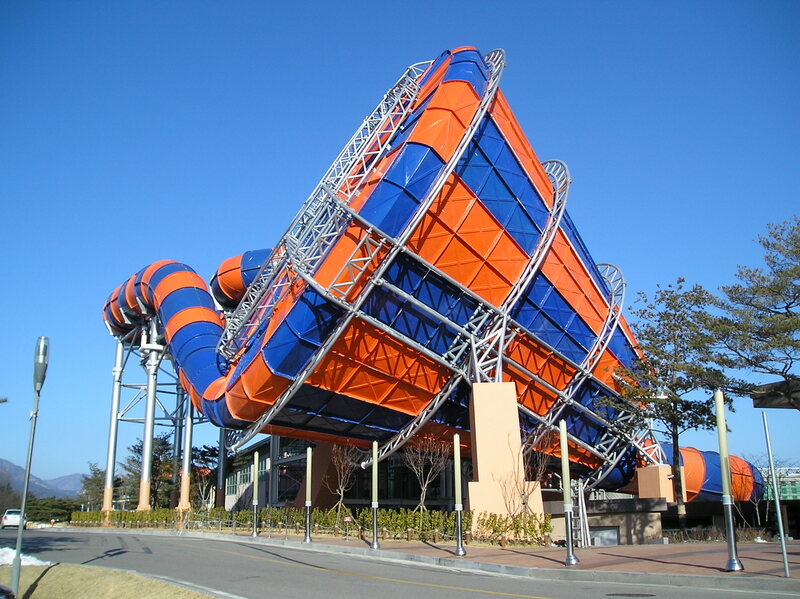 The prototype was “The Mael Strom” at Hanwha Resort Seorak location. It is located in South Korea a few hours away from Seoul. 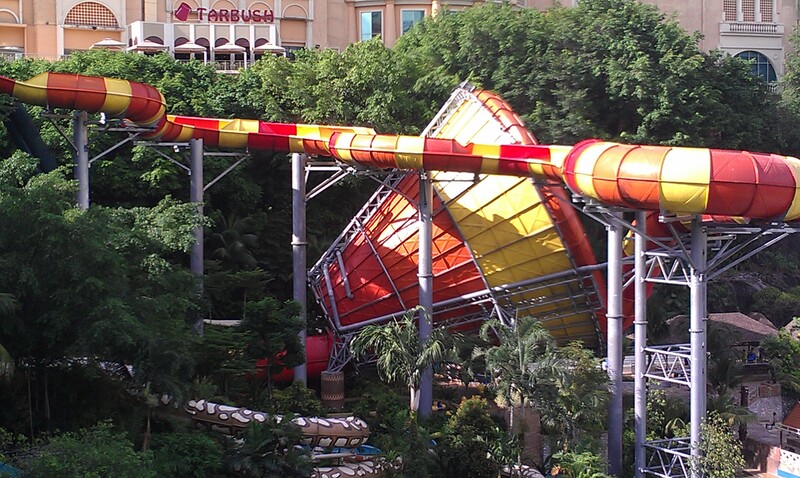 Over 300 feet of raft slide action is present before the dramatic drop into the funnel on “Vuvuzela” at Sunway Lagoon (Petaling Jaya, Malaysia) in 2012. A view at the slide from the park suspension bridge. You can see the large drop into the funnel. 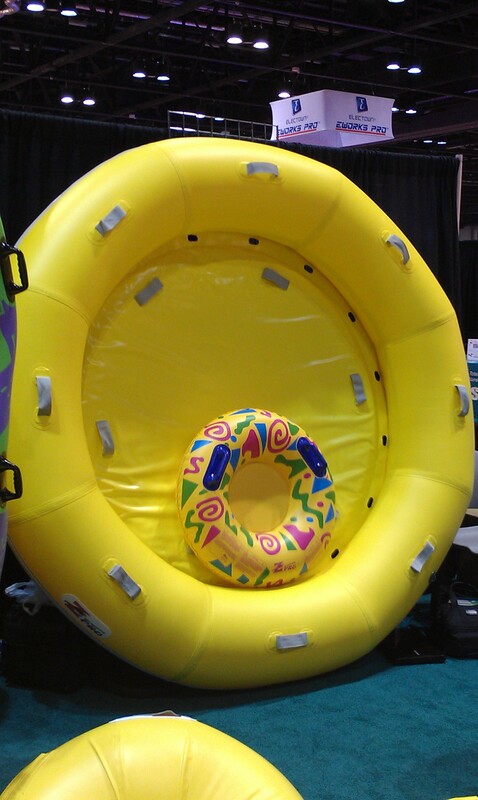 The Abyss uses a large raft similar to this and notice the size difference between the single person tube and the 6 person raft. So, unlike the Cloverleaf raft, passengers cannot bring them upstairs by themselves and a raft conveyor must be installed. In 2014, WhiteWater introduced the first Aquasphere. It is a very flexible design and anything from 2 person inner-tubes to 6 person rafts can be used. After thrilling flume sections, the raft enter small spheres where riders climb the wall up to a 90 degrees angle before coming the bottom and continuing on their way. 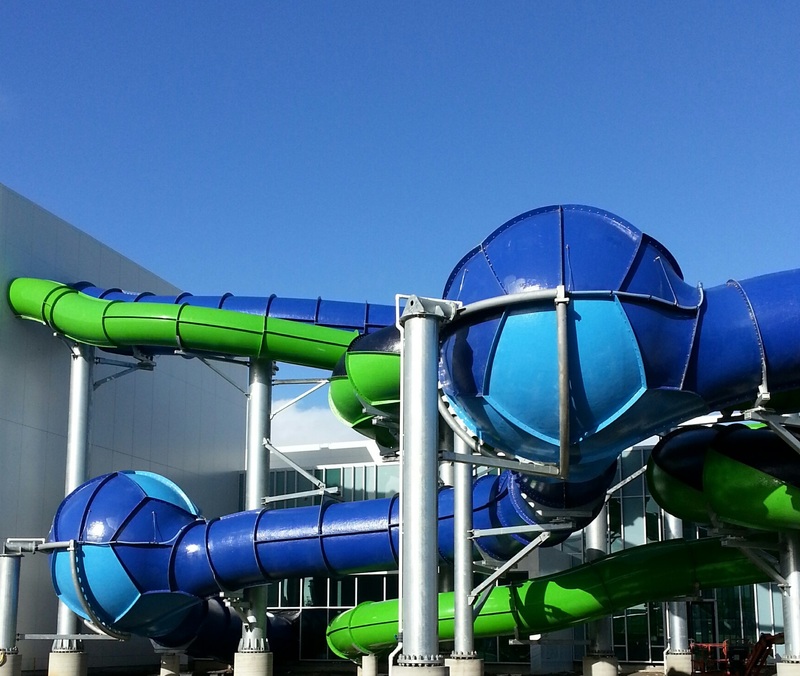 The first installation at the Peninsula Aquatic Recreation Center (PARC) in Frankston, Australia features 3 spheres along its course. In 2015, WhiteWater supplied all the attractions for a new development in Eastern Jakarta, Indonesia. 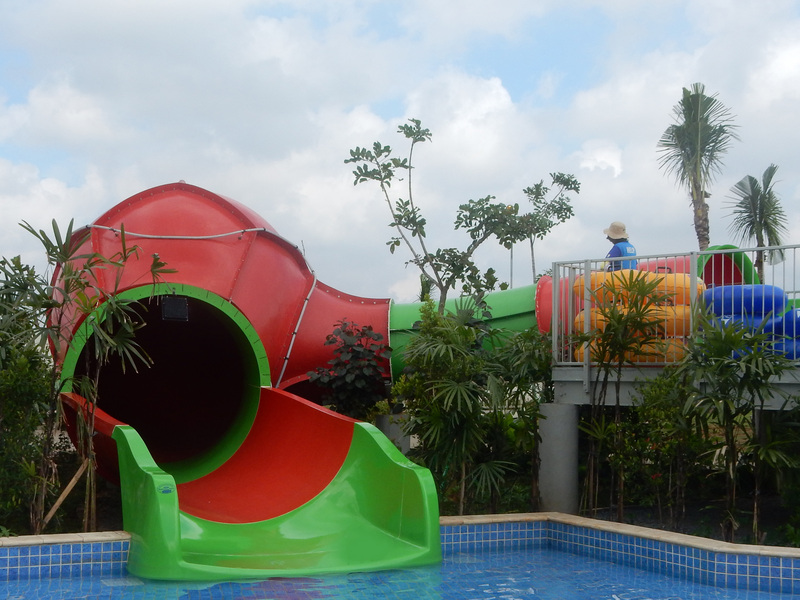 It is a part of the new Grand Wisata Master Planned Community and the waterpark is called “Go! Wet”. The slide that we are going to look at for this article is the world’s first Kid’s Aquasphere. It is a smaller version of the slide that premiered the year before and the goal was simple: allow younger kids to have the same experience as their parents and older siblings. 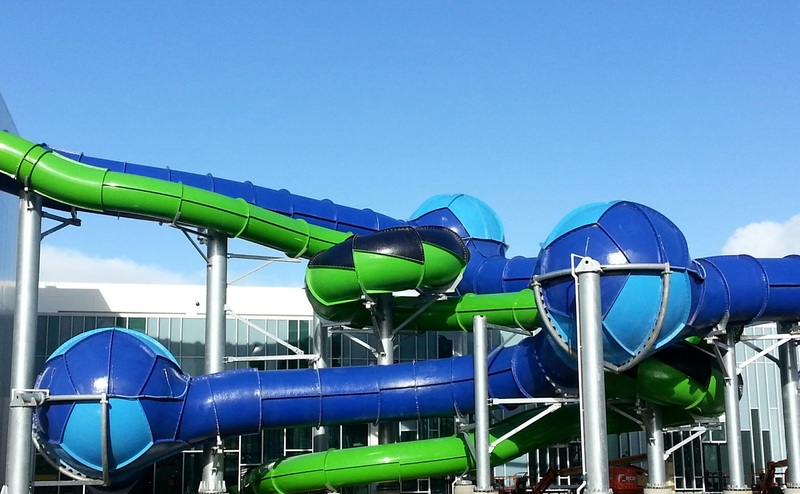 This entry was posted in Water Ride and tagged Abyss, Aquasphere, water slide, Waterpark, WhiteWater, whitewater west, WhiteWater West Industries LTD. Bookmark the permalink.